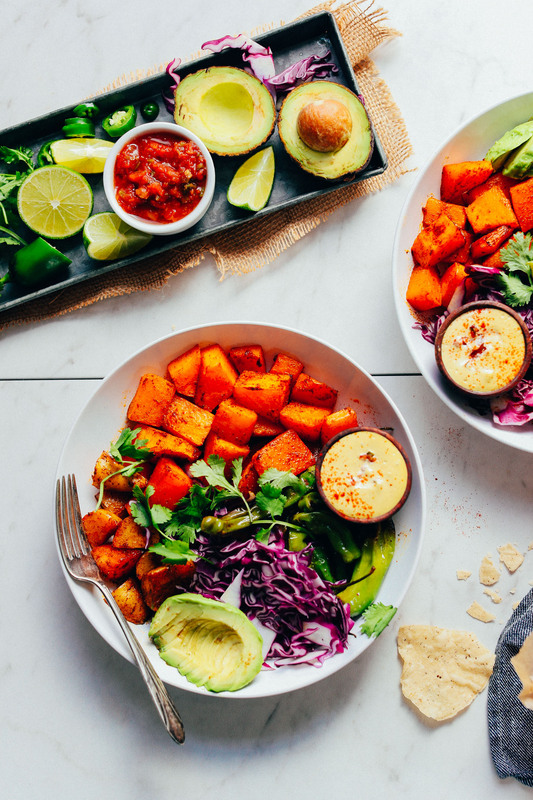 The butternut squash bowl. Finally, another reason to put queso on things. Because everyone knows that the world needs more (cashew) queso. Truth. This easy weeknight meal comes together relatively quickly if you already have your queso made (which I usually do, and you probably should, too). And it requires 10 fall-friendly ingredients that remain incredibly versatile depending on what you have on hand. I’ve been stocking plenty of squash in the house lately, and because butternut squash is slightly sweet, I knew that it would play well with cumin, chili powder, and – of course – my Roasted Jalapeño Queso. 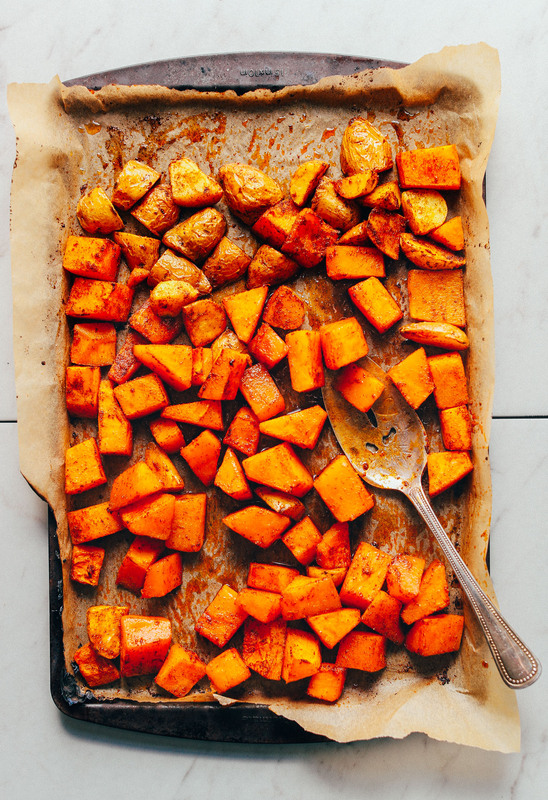 But, really, any squash (or sweet potato!) should play well here. For more protein (which I wasn’t too worried about thanks to the cashew queso), you could easily add something like cooked black beans, Smoky Chipotle Tempeh, or even quinoa. This would make the perfect weeknight meal or even a great dish for hosting, as the recipe can easily be double or tripled. It’s delicious on its own, but it would also pair well with my Ginger Beer Margaritas, Mexican Quinoa Salad, or Vegan Kale Chip Nachos! If you try this recipe, let us know! Leave a comment, rate it, and don’t forget to tag a photo #minimalistbaker on Instagram! We’d love to see your bowls in action. Cheers, friends! 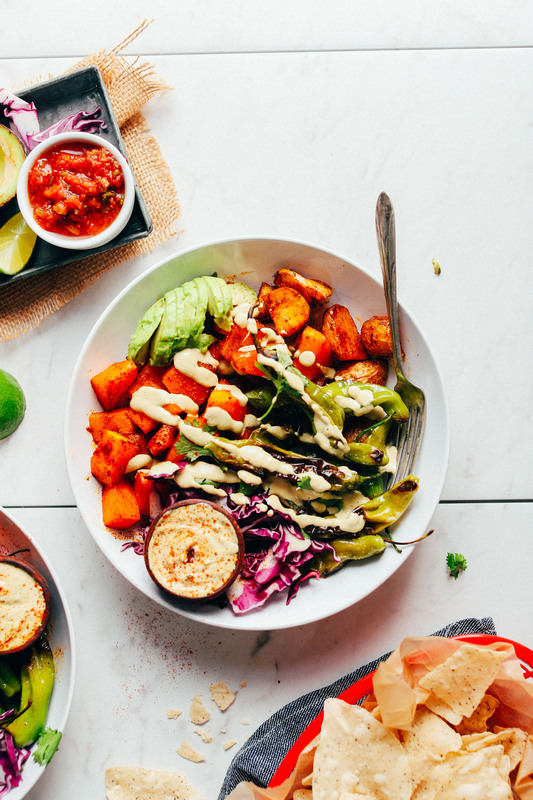 A versatile Mexican-inspired bowl with butternut squash, peppers, and vegan queso sauce! Just 10 ingredients required for this satisfying plant-based meal. If you haven’t already, prepare your queso (if using) and set aside. Preheat oven to 375 degrees F (190 C) and line a baking sheet with parchment paper. Add squash (and potato if using) and drizzle with half of the coconut oil (1 Tbsp or 15 ml as original recipe is written), cumin, chili powder, half of the sea salt (1/4 tsp as original recipe is written), and maple syrup. Toss to combine. Then bake for about 20-25 minutes or until very tender and slightly caramelized. In the meantime, heat a skillet over medium-high heat. Once hot, add remaining coconut oil (1 Tbsp or 15 ml as original recipe is written) and poblano or shishito peppers. Season with remaining sea salt (1/4 tsp as original recipe is written) and sauté for 4-5 minutes, stirring frequently. Set aside. 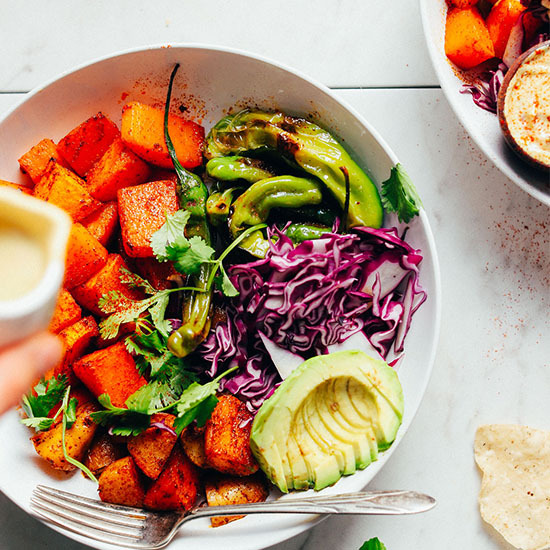 To serve, divide butternut squash (and potatoes if adding), sautéed peppers, cabbage, and any other desired toppings or additions (such as avocado, pepitas, quinoa, tempeh, or tofu). Serve with Cashew Queso (and/or salsa). Best when fresh. Store leftovers separate in the refrigerator up to 3-4 days and reheat on the stovetop or in the microwave. *Nutrition information is a rough estimate calculated without additional toppings or sides. In the cashew queso! Additionally, for more protein you can add cooked black beans, Smoky Chipotle Tempeh, or even quinoa. This butternut squash is amazing! My husband is lucky he got to try it. Cause it wasn’t going to last too long. I love all your recipes! Could I use frozen butternut squash for this recipe? This is so amazingly delicious and filling. The queso dip makes this spicy and dreamy. I used black beans to add protein and they were perfection. 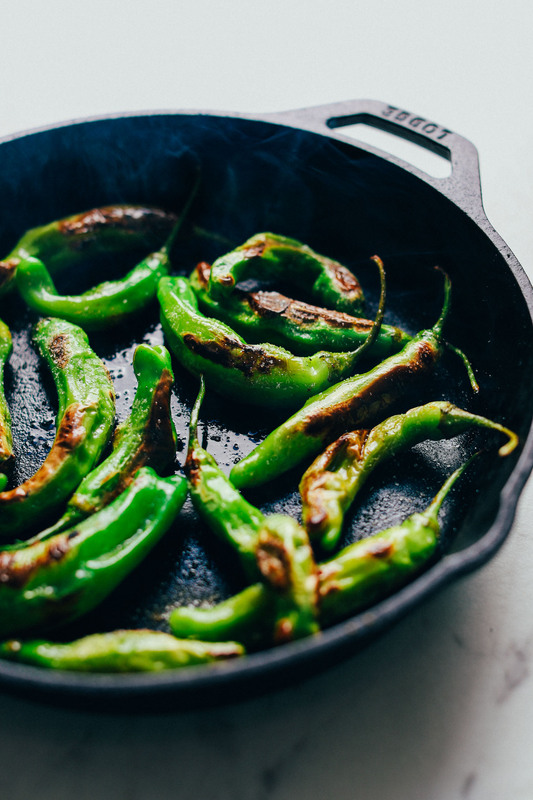 If I made this with the cashew-less queso, could I still add the roasted jalapenos? Hi Elizabeth! That should work! I made the queso (easy!) and cut up the squash the day before. That made it a snap to put together last night. There is so much flavor in this dish! We loved this and will definitely make it again. Totally loved this recipe! My partner and I added some baked Brussels sprouts and yams along with some vegan burger patties from the Very Good Butchers. Thanks Dana! I wouldn’t have thought to make this meal before. Just made this for dinner and it was so good! I didn’t have any hot peppers so I made it with sauteed red and yellow bells. Loved the contrast of crunchy cabbage and the creamy queso. I just made this tonight and OMG. Dana, I’ve been vegan now for about two months and I’m so thankful for your recipes. This hit the spot! That jalapeno queso is divine. The flavors went so well together! I added black beans and small bed of mixed greens to make this somewhat of bowl/salad. Yum! What a hearty and delicious recipe! Butternut squash is one of my favorite vegetables to cook with! Great for breakfast, lunch, dinner, really anytime of the day! This looks amazing. I’m always on the look out for a good vegan queso. Can’t wait to try this, thanks for the post. Hello Dana! We live in Shanghai and can’t find shishito or poblano peppers. do you have a substitute that would go well with this dish? Thank you!!! Really any mildly spicy pepper will do! 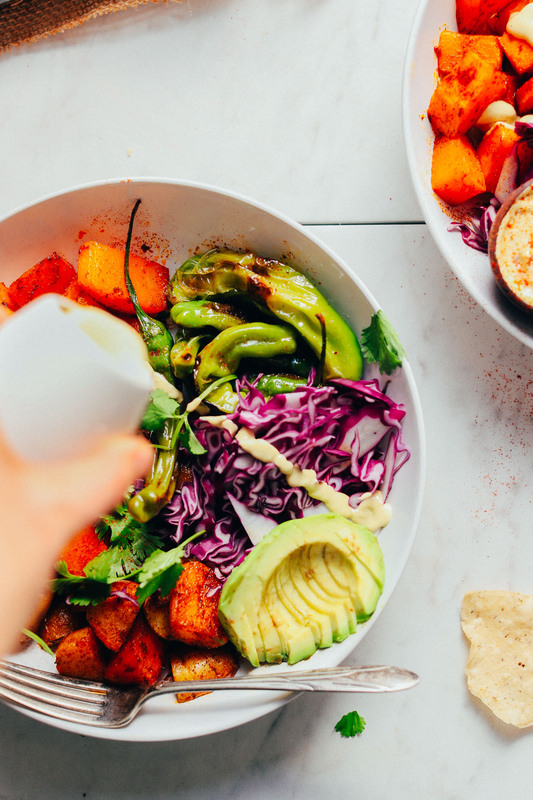 Dana, I’m absolutely loving all of these roasted veggie bowls you’ve been creating! Keep ’em coming! Everything looks YUMMERS! LOVE all of the color! Beautiful! I love all of your recipes. I’m going to make this for dinner tonight. I purchased your cook book and love it too. So kind! Let me know how this one goes. xo!